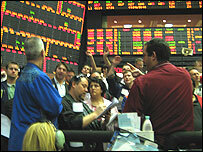 The corn trading pit of the Chicago Board of Trade is an extraordinary place. People yell orders and give frantic hand signals to seal their bargains. The traders wear garish jackets, so that someone across the floor will know who he or she is dealing with. The latest prices of consignments of corn for future delivery are displayed on giant electronic boards along the walls. And, although the price fluctuates minute by minute, over the last year wholesale corn prices have roughly doubled. The reason for the surging price is increasing demand from refineries that are buying corn - or maize as it is sometimes called - to turn it into ethanol. The ethanol is then blended with conventional fuels for use in ordinary cars. "We are using 20% of our corn for ethanol," says Roy Huckabay, executive vice president of the Linn Group, which advises commodity investors. "When the energy markets went bananas over the last year, the value of corn as an energy source sky-rocketed." The US Government is promoting the use of ethanol with subsidies. And President George W Bush has set ambitious targets for increasing the use of bio-fuels in future. Ethanol produces lower greenhouse gas emissions than conventional fossil fuels. But many observers think that the big attraction of bio-fuels for the Bush administration is that they will reduce America's dependence on imported oil. The policy is also making some American farmers very happy. 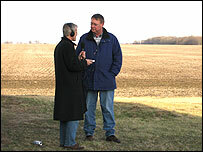 Sam Martin manages 19,000 acres of land, mainly in Illinois. He has always used some of the land to grow corn, but is now adding to the area that will be seeded with corn this spring. "2007 should be a wonderful year," he says with an optimism uncharacteristic of the often hard-pressed farming community. "At the coffee-shop people were talking about doctors quitting and taking up farming." But the impact of soaring corn prices on consumers is likely to be less beneficial. Corn is used directly by the food industry in things like corn flakes. It is also widely used for feeding animals like pigs and chickens. And food companies are warning that high corn prices will feed through to everyone's grocery bills. In Mexico, there have been street demonstrations about the rising cost of tortillas, which are made from corn. And rising food costs are unlikely to be the only impact of biofuel refineries buying into the corn market. In places like Illinois, the price of agricultural land has started to rise. That will eventually feed into the cost of other agricultural commodities. Sam Martin puts it succinctly. "I think that cheap food is history," he says. This trade-off between greener fuels and higher food prices is one of several difficult issues thrown up by the rapid development of the biofuels industry. The world has already witnessed the absurdity of virgin rainforests in Asia being torn down to make way for palm oil plantations. Palm oil, like corn, has become hugely profitable because of demand from biofuel producers. But the environmental benefits of the biofuels are outweighed by the loss of the rainforests. Biofuels can make a contribution to reducing greenhouse gas emissions. But the processes by which they are produced need to be kept under constant review to make sure that they do not have perverse consequences. And that includes forcing up the price of essential foods.